This is one of my newest almost-favorite picture books. Stick is a little frog who wants to do everything all by himself. But with a very sticky tongue, things don't work out as he expects and he goes on a wild, tongue-pulling journey! 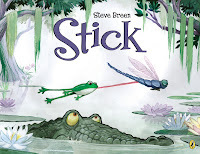 I love the many shades of green throughout the illustrations and Stick's adventures are perfectly and hilariously expressed through variously-sized panels. My only quibble is the text. It's really unnecessary, as the pictures tell the story all by themselves and it's obvious at first glance that this could be a perfect wordless book. The text doesn't add to the story, just fills in what the reader is seeing and distracts from the perfect sequencing of the plot in the pictures. Still, for those who want to use this in storytime and have trouble with improvisation, the text will be a useful frame for discussing the illustrations. I loved it! Yes, it's a "happy" story. There's tension, confusion, some painful scenes, some betrayal. But in the end, it's happy. Yes, there are little dancing fairies. Yes, the main character is the daughter of...well, we'll let you figure it out. But I liked it! The characters fit well into the plot and acted in accordance with their roles. 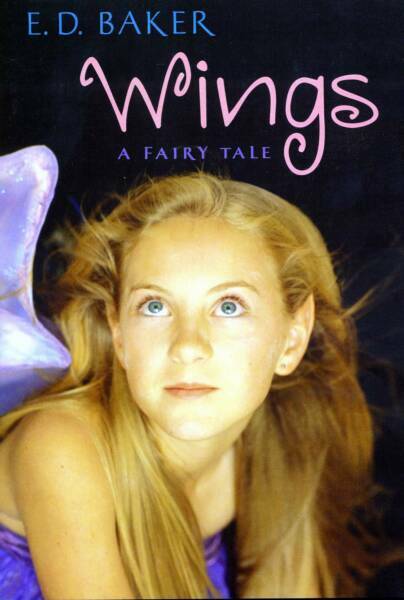 I especially felt the descriptions of the wings and trying them out were well-drawn. And there's plenty of tension left over for me to want another book right now! But apparently the next book in this trilogy won't be out for a while. Verdict: This book is for those little girls who've grown out of their fairy series but still like sparkly wings and fairy dancing. For those who like adventure with a happy ending. And for those who don't feel like they belong anywhere. Plus, the lamias were really funny! Um...reading this was like spending a significant amount of time in the brain of a seriously disturbed child. Possibly that was the intent. Kaline (is that really a name? a boy's name?) doesn't know where his dad has gone or why. He's scared of the next door neighbor, his mom is acting even stranger than usual, and bullies are making his life miserable at school. Fortunately, he has his imaginary tree house and friends to comfort him. Kaline's weird speech patterns kept throwing me out of the story, since I couldn't decide if they were typos or just the way he talked. I agree with him that his mom is nuts and wonder how on earth she manages to hold down a job as a paralegal when she is so completely scatty. And why is Kaline not in some kind of therapy? He obviously has major issues and needs help. The main part I did not buy was his dad. Here's a guy who is clearly as crazy as the rest of the Klattermaster family - timing your child's bedtime rituals is a sign of a serious problem, not to mention exacerbating his son's mental and social issues (at least according to Kaline's mom) - who leaves his son without a note or goodbye, and suddenly he reappears, says Kaline can be as messy and unorganized as he wants, and is all over him. Call CPS somebody and hand Kaline over to the next door neighbor. Who hopefully can get his name changed. In less than a month, I have interviewed, been offered a job, accepted, finished school (except for those last couple classes, but hey I was packing!) started my new job, and become a veteran youth services librarian of 2 1/2 weeks! All the horror stories of library school....total guff, the lot of them. I haven't dealt with any nasty patrons (although I'm sure they're out there), had to clean the bathrooms, broken the copier, been snubbed by the cataloguer, or crashed my computer or felt utterly lost, alone and not having the faintest idea what I'm doing. My first book order! There's something so alluring about picking out books and sending off the order....buying books is one of my favorite things to do. We'll see how I feel after I've done my first storytimes alone this summer...and summer reading programs....but so far it's been a blast! The first of the church mice stories by Graham Oakley sets the style and pace for each of the further adventures of the hilariously human mice. 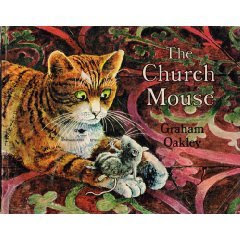 Arthur, the church mouse, feels lonely with only reformed cat Samson for company and invites all of the town mice to move into the church. At first, all goes well; the mice help out in return for cheese and life is good. But when Samson falls asleep during the Vicar’s sermon, the mice’s arrangement is ruined. However, thanks to a fortuitous burglar, Samson and the mice redeem themselves and there is a happy ending for everyone. This picture book is most suitable for children able to appreciate the ironic humor and detailed pictures, but will also be enjoyed by younger children, who can follow the action through the illustrations, and older children who will catch the sly jokes embedded in the text and illustrations. It is not suitable for large groups, as the pictures are fairly small and detailed. The format of the illustrations and text shifts from page to page. The first page is a full-spread illustration of the village seen from above, with the single sentence of introductory text inset in the corner. The village is a mixture of modern and medieval, the older architecture of the houses and shops mixed with television aerials and cars, giving a picture of a traditional village moving comfortably into the modern world. The lines of the drawing direct the audience’s attention to the church, showing its central importance to the village and the story. After this introduction to the general setting, the rest of the story is told in illustrations of varying sizes interspersed with blocks of text. All of the illustrations are strongly realistic in style and the broader panoramas have the slightly fuzzy quality of a watercolor or unfocused photograph. These individual illustrations tell a story of their own, at times paralleling and enhancing the narrative contained in the text but more often providing a humorous reinterpretation of the apparently bland narrative. For example, in the second coupling of illustration and text, the words read alone are without particular interest, “Arthur liked living in a church. For one thing, he was very fond of music, particularly if it was loud.” However, added to the picture of Arthur balancing on an ornately carved pillar directly in front of the organ’s pipes, his tail and whiskers streaming out behind him, eyes closed in ecstasy and conductor’s baton raised, these simple phrases become subtly humorous. Other small touches, such as Arthur meditating while perched upon the nose of a statue, perfectly express the dry wit of the story. The illustrations have a strong background of earth colors, the multitudes of gray and brown mice, their colors shifting with the surrounding setting, the stone and brick of the church, the deep orange of Samson the cat, all linking the animals to the country village and maintaining its rural flavor. However, dashes of bright color hint at increasing modernization, as seen in a bright red car and the sometimes garish clothes of the villagers. In the third section of the narrative, after Samson and the mice’s disgrace, the illustrations shift the story, first changing in format to cover double pages and allow for larger blocks of text, but also reemphasizing the earth colors in the wood of the empty church and then warming into the evening fire and Samson and Arthur’s miserable disgrace. After this transition, the story shifts back to the sets of illustration and text, all of the illustrations being drawn in blue and white shades showing the night-time action of the burglar and his apprehension by Samson and the mice. A great deal of the humor of the story derives from the detailed expressions on the character’s faces. Although the mice remain a largely anonymous group, excepting only Arthur and his new rival and sometimes friend Humphrey the school mouse, each mouse is drawn with a specific expression and role in each individual illustration. They are lifelike in their general anatomy, but anthropomorphized in expression and movement. Their strong communal attitude is expressed in their consistent portrayal in groups, both large and small. Samson also contributes to the hilarity of the tale, continuously being drawn into the mice’s plans against his will, as can be seen in his patient but at times bewildered expression. Although in some ways the book could be considered outdated, especially in the clothing of the townspeople and a few British cultural references in the text, the innate humor and action of the story and illustrations remains. Younger children especially will enjoy the narrative and action of the pictures themselves, as the groups of mice alternately argue and cooperate in their tasks and adventures. This is a story children can enjoy again and again, finding new elements as they grow older and catch the irony and sarcasm conveyed by the combination of text and art or discover hidden jokes in the illustrations themselves. Verdict: FYI this review is extremely lengthy because it is actually an assigned review I wrote in graduate school. Anyways. While the church mice aren't for everyone, enough parents will rediscover them with joy that it's worth hunting down the reprint of the first title at least. 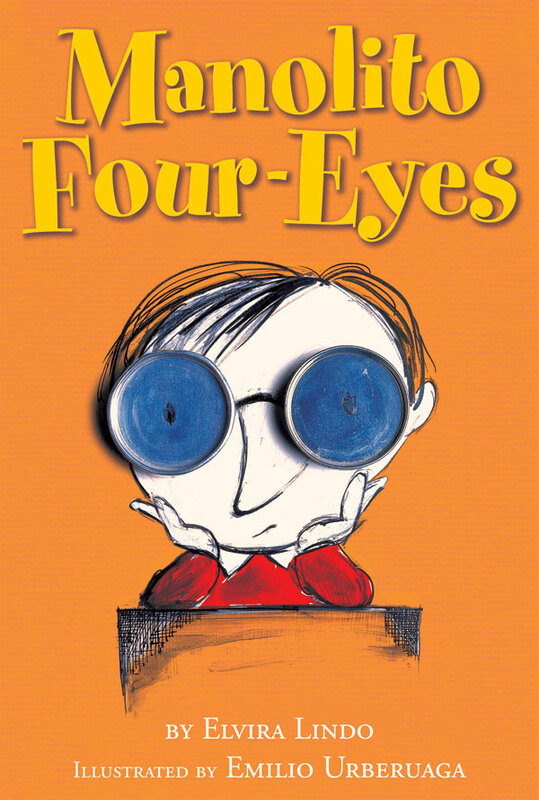 If Goscinny's Nicolas had married a woman from Spain...Manolito Four-Eyes would be their son. Elvira Lindo's best-seller in Spain has been translated into various languages - finally English! and also made into a tv show. Manolito is definitely the heir of Goscinny's Nicolas. His language is a little rougher, he's more into "gross" and tv is a definite part of his life, but under the skin he's another Nicolas. Not outstanding among his peers, just an ordinary little boy - who drives all the adults crazy! He has the same authentic voice as Nicolas, and almost the same naive indifference to the havoc he creates around him. I enjoyed this book quite a bit - but it's one that may or may not be a hit on the library shelves. 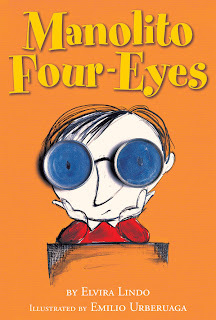 Verdict: If you can get a few kids to appreciate the humor and fresh voice of Manolito, this could be quite popular, but it will take some booktalking. The premise - Cammi is one of the Gallagher Girls, an elite sisterhood of potential spies in an expensive boarding school. She falls in love with a "normal" teenager and spends the semester performing a special, not-for-credit covert ops project - Operation Josh. The totally cliche'd and why did they even mention it? Ok, the whole I am homeschooled for religious reasons and am therefore clueless about any type of social interaction and lead a sad and boring life is soooo outdated. Not to mention completely at odds with the "I've been to Mongolia because my parents were into the Peace Corps" Cammi needs to match up her cover stories - or just dump them and start over. But, on the whole it was a fun read! 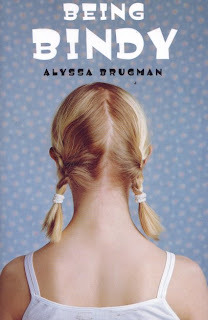 Verdict: A light fun read that teens will be eager to gulp down. Highly recommended. A badly drawn dog decides he needs a different look. But each time a "real" artist redraws him, something goes wrong. In the end, he decides he'd rather just be himself. The various art styles Badly Drawn Dog is recreated in are fun and the silly names will grab children's interest. The "just be yourself" theme is well-worn, and I can't help feeling that, at some point, telling kids it's bad to change your image can be just as stultifying as being forced to match someone else's idea of what you should be. Badly Drawn Dog isn't allowed to enjoy his new looks because his friend, Doodle the Poodle, is more comfortable with him unchanged. Eventually, he decides he's happier as he is. But he was happy with his new appearance until Doodle criticized him. I think Badly badly needs a new friend. Verdict: Just my weird take on the story. The swirly, smudgy, art is fun though. A little dog named Polo sets off from his tiny island tree house. As he journeys, he meets new friends and explores strange and new places. What drew me into this wordless comic-style picturebook, was the seamless way Polo moves from place to place and between different modes of transportation. First, his tightrope becomes stairs into the sky, then a fishing line that he can slide down. 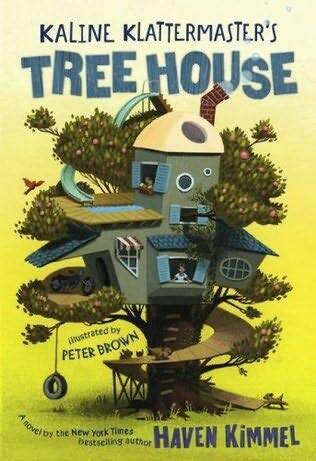 His boat becomes an airplane, a tree house platform becomes a hot-air balloon, and much, much more! I also love the brisk, definite lines of the art and the primary colors. 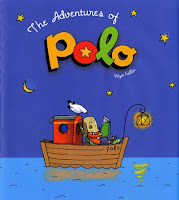 They give Polo's adventures a cheerful, homey air, although he is wandering alone, far from home. All the characters he meets, with one exception (grumpy polar bear!) are friendly and each little scare has a happy ending. Verdict: This is a happy read for poring over alone or with friends and children. It would make an excellent special present as well as a good addition to your library's wordless books or graphic novel collection. Somehow, Muncha! Muncha! Muncha! just didn't grab me. 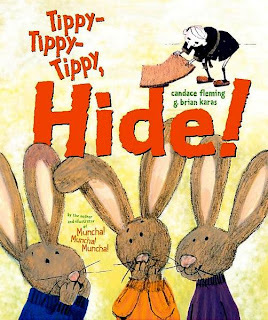 But Tippy-Tippy-Tippy, Hide! did. Three cold little bunnies are up against mean Mr. McGreely (sounds kinda like McGregor, huh?). Every time they find a way in he blocks it. Until he finally wins the battle....or has he? The scrawly illustrations, including menacing eyebrows on the part of Mr. McGreely and huge bunny ears are mischievously engaging and there's enough rhyme and repetition to hold the interest of a variety of ages. Children will get a kick out of the naughty bunnies, who find their way inside no matter what McGreely does - and eventually have the last laugh! Weird. That's pretty much all I can think of to say about this book. Stanley is mowing his lawn. He sees a snake. The snake zigs and zags. 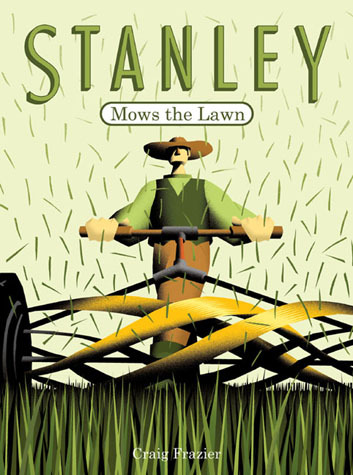 Stanley mows his lawn in zigs and zags. The end. There's a kind of retro feel to the solid, simple illustrations, which are all in shades of green and brown. It looks like this has gotten a lot of good reviews, but...I don't really see the point of the story. Possibly I need more art education. Up till now, Bindy's life has been ok. She had a best friend, Janey, who was practically like a sister, she lived with her easygoing Dad, and her brother Kyle wasn't too big of a pain. But suddenly, everything is changing. Janey is no longer her best friend, Dad is dating Janey's mom Liz, and Bindy's workaholic and absent mother is trying to get back into her life. And then there was the Very Worst Day at school. Followed by an Even Worse Day at school. And Bindy makes some surprising discoveries about her family and friends. 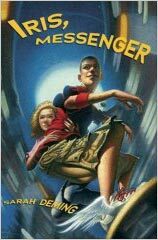 Verdict: Kids that feel like everything's happening to them and no one cares will appreciate Bindy's low-key drama. I enjoyed reading it, but have no major regrets that it's out of print. There are both pros and cons to this picturebook. You have to be familiar with several stories to really "get" the story - Three Billy Goats Gruff, Gingerbread Boy, Goldilocks and the Three Bears, and Three Little Pigs. Now this may seem like a no-brainer, but I read Bad Boys Get Cookie to a mixed group of kids a while ago and not a single one got the Hansel and Gretel reference. Pros: Lots of arfy goodness - I can see some excellent storytimes ahead with a good barking chorus. Fans of the interrupted narrative, as in Melanie Watt's Chester books will love this! Verdict: So, not perfect, but a good solid addition and I think will be well-received at any library. The cover was the best part of this book. The story has a well-used plot - the beloved pet animal who gets too big for his owner. 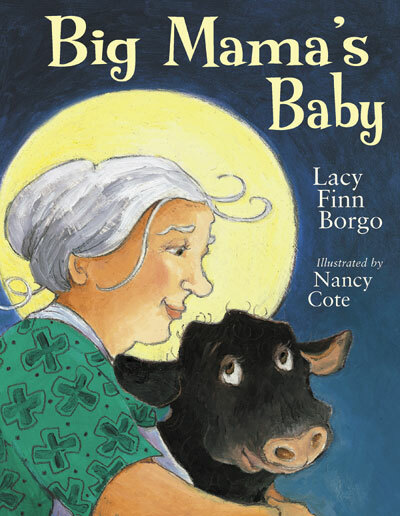 In this case, a stereotypical older woman (seriously, would any woman be called "Big Mama" anymore?) raises a calf and then, giving the reader serious doubts about her ability to support and run her farm, refuses to sell him, even though he is destroying her garden and causing trouble. Eventually a happy solution is reached. The illustrations don't live up to the cover. The faces are oddly proportioned and the art seems rough and amateurish. 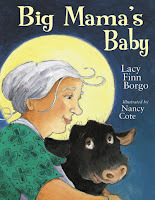 The art shows what apparently is meant to be a contemporary small town with a diverse cast and modern clothing, but the elderly woman running her own small farm, and pet calf, and the name "Big Mama" seem to come out of another era. Verdict: A sweet idea and a lovely cover, but it just didn't work. Not recommended. I don't remember why I picked up this book, but I kept reading it hoping something would happen and it would all make sense....no such luck. The main problem with the book is democratic plots. Each plot has an equal vote, and they all voted for themselves, so they all got a say in the story and....you know the old fable of the man and his son taking the donkey to market? Everybody had a different idea, he tried to please them all, and they lost the donkey. So, the book starts out with a kind of interesting premise. Iris, teased at school by both unpleasant fellow students and her excessively strange and sadistic teachers, lives in a world of marvelous dreams. She writes sentences, ideas, scraps of dreams in gold on the underside of her quilt (this is a marvelous bit of imagery and very well done). She lives with her mother, who is a soybean researcher working in a tofu factory, and fends off calls from her religious Jewish father, who is obsessed with her stepmother's unending ailments. Quirky parents, kinda overdone and not really believable. She meets Poseidon, who is now a depressed and dying beach bum. He feeds her delicious oysters and tells her the story of Halcyone. Iris leaves Poseidon in misery, vowing to help him somehow. She meets Apollo and under the influence of his magic sings the story of Phaethon. She also meets Amphitrite, Poseidon's lost love and gets a card for Aphrodite's salon. Iris gets a prophecy from the Sibyl (who lives in the basement) saying that if she goes to war a great empire will fall. Dionysus, after a long discussion over the legality of it all, gives her wine and information, starting with the story of his wife, Ariadne. Iris meets Ares, who is now a lawyer, on her way out and talks him into suing the tofu factory for her mom. An appendix. Showing documents of Ares blackmailing the tofu factory into giving Iris' mom a settlement. An announcement of Poseidon and Amphitrate's wedding, and an announcement of a new tofu factory, started by Iris and her mom, which seems to incorporate the various gods' businesses. Verdict: There are any number of good plots, ideas, and possibilities in this story. The problem is that they're all in there, rather than making about six different books. This leaves no room for the characters, which fall painfully flat, and way too many retold myths.